Turkish President Recep Tayyip Erdogan proclaimed that his country would “cover most of Venezuela’s necessities” economically during remarks in the Latin American country Monday. 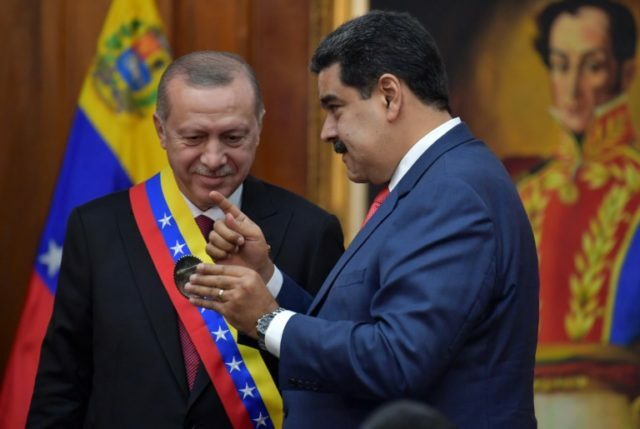 Erdogan, who is in Venezuela following his attendance at the G-20 summit in Buenos Aires, Argentina, this weekend, made the remarks after signing a series of agreements with Venezuelan dictator Nicolás Maduro that includes Turkish investments in Venezuela’s oil and mining industries. Erdogan and Maduro have become increasingly close in the past two years as Russia and China, once the Latin American nation’s most reliable benefactors, began to withdraw from the country as its slow economic collapse began endangering their investments there. On Monday, Erdogan announced that Turkey was large and powerful enough to fill voids left by such economic heavyweights as Russia and China. “We will cover most of Venezuela’s necessities, we have that strength, we have that opportunity,” Erdogan said through a translator, according to the Spanish newswire service EFE. Atop his list of projects within Venezuela was “improving the business environment” and creating a “sustainable” and “diversified” bilateral trade relationship. Maduro announced that Erdogan had expressed particular interest in Venezuela’s mining industries, including gold. The Venezuelan socialist regime has launched a campaign to attract foreign investment to extract its vast gold resources as a way to offset the prodigious losses from its once-dominant oil industry. Venezuela is home to the world’s largest known oil reserves yet, under Maduro, oil production in the country has entered a state of “freefall” following the widespread nationalization of extraction and refineries. The companies once responsible for extracting and refining the nation’s notoriously heavy crude are now run by friends of Maduro’s or loyal socialist lackeys with little to no experience in the oil industry, hindering production. Similarly, Maduro has largely allowed gold mining to fall into the hands of roving criminal gangs. Turkey’s investments may be able to normalize the situation in Venezuela’s gold-rich regions, even after the United States levied sanctions explicitly on Caracas’ gold industry. The Venezuelan government also reported that Erdogan announced the construction of “a small mosque in Caracas” and launch of a cultural exchange campaign. Erdogan, an Islamist leader who has explicitly made calls for the spread of Islam around the world, spent years attempting to convince the communist government of Cuba to allow Turkey to fund the construction of a mosque in the country, despite the nearly non-existent Muslim population there, arguing that Muslims discovered America before the Spanish arrival in 1492. a repressive atheist state, rejected the request repeatedly. Erdogan then turned to Maduro, inviting him to attend a meeting of the Organization of Islamic Cooperation (OIC) last year and his inauguration this year. In October 2017, Turkey announced that it would invest not in a mosque, but in the construction of the “Yunus Emre Turkish Cultural Center of Caracas,” which would in part serve to spread Islam in the country. The cultural center will be the first of its kind of Turkey in Latin America. Erdogan took the time to thank Maduro on Monday for his alleged contributions to fighting “Islamophobia” by attending the OIN meeting. The Turkish pro-Erdogan newspaper Yeni Safak reported Tuesday that Erdogan has his eyes on more than just Venezuela.